The site of medieval Euchaïta, on the northern edge of the central Anatolian plateau, was the centre of the cult of St Theodore Tiro ('the Recruit'). Unlike most excavated or surveyed urban centres of the Byzantine period, Euchaïta was never a major metropolis, cultural centre or extensive urban site, although it had a military function from the seventh to ninth centuries. Its significance lies precisely in the fact that as a small provincial town, something of a backwater, it was probably more typical of the 'average' provincial Anatolian urban settlement, yet almost nothing is known about such sites. 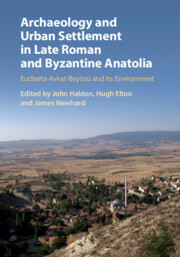 This volume represents the results of a collaborative project that integrates archaeological survey work with other disciplines in a unified approach to the region both to enhance understanding of the history of Byzantine provincial society and to illustrate the application of innovative approaches to field survey.